Elastolin Indians and cowboys. Pre-war, Germany. Elastolin Indians and cowboys. Pre-war, Germany. Collection of indians and cowboys- figures and accessories from Elastolin. Pre war. Excellent condition. Price range from 15 € -50 € each. The price shown is an average price for a good piece. Please contact me for further photos or come to our shop for a closer look. Or email your seraching list. Our inventory in this catagoty changes very often. Dodge Falck Lorry made by Tekno,Denmark. Triangel fire car made by Tekno,Denmark. Triangel fire car made by Tekno,Denmark between 1946 and 1959.Zonen.Good condition with some scratches. L=4 3/4 inch-12 cm. Triangel Fire engine made by Tekno Denmark between 1946 and 1959.Good condition with some scratches. L=4 3/4 inch-12 cm. 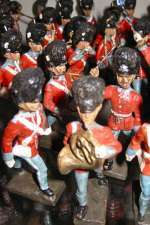 The Royal Danish Guard made by Lineol. 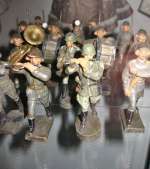 There are musicians, and guards walking.The figures are made in Germany for the Danish market about 1940.The prices are avarange prices for pieces i good condition.Figures in different sizes and in different shapes.Please contact for further information, come by our shop or send us your seraching list..We often change the stock, as these are going quick. Note: Average price for one piece. Lineol/elastolinsoldiers.Lineol- and Elastolin soldiers and accessories.The figures are made in Germany about 1940.The prices are avarange prices for pieces i good condition.Figures in different sizes and in different shapes.Please contact for further information, come by our shop or send us your seraching list..Collection.We often change the stock, as these are going quick. So we try to get new items quick. Matchbox.1958 Y5-1(3).Model of Yesteryear.Le Mans Bentley 1929. Racing green. Green radiator grille.Gold radiator surround.Mint/box. Matchbox miniatures 1958.MB 56a.Red London trolley bus with red poles. Grey wheels.Mint/box.The box missing 2 flaps.